Their research which ranges between 2014 to 2016, investigated the information needs and preferences of residents of Johannesburg. STUDENTS ARE the smartest demographic of people in Johannesburg, this is according to research presented by two Wits professors from the School of Economic and Business Sciences. From the research it was revealed that “young urban residents” cared the most about technological services such as “fast internet, access to WiFi, information on city events and tools to track transport”. The Information Systems for Smart Cities in Africa research project was presented by Professors, Jason Cohen and Judy Backhouse, at the Wits Professional Development Hub on Wednesday, September 27 under the title Smart people, smart cities. Their research which ranges between 2014 to 2016, investigated the information needs and preferences of residents of Johannesburg. It also looked at how these needs represented the city’s information services and received over 27 490 respondents. “I think at the moment, students are pretty smart, both in the sense of being clever but also in the sense of using technology a lot. And I think students are in a privileged position because they do have access to computers and the internet at university,” said Backhouse. Former Masters in Information systems student, Nalukui Malambo, who was involved in the research at the time, said that the “massive use of technology” at this time period, allows students to voice out their opinions. “People that are students now, can say what they think is important for us [students] in this time period. Whether it is education or through modes of learning,” said Malambo. Tools to track movements of transportation vehicles was one of the key services that students said they wanted in a smart city. Speaking at the event, Obakeng Matlhoko, one of the team members who built an application aimed at improving the safety, efficiency and communication for the taxi operators and commuters believed the Afta Robot app will change the lives of students in terms of public transportation. 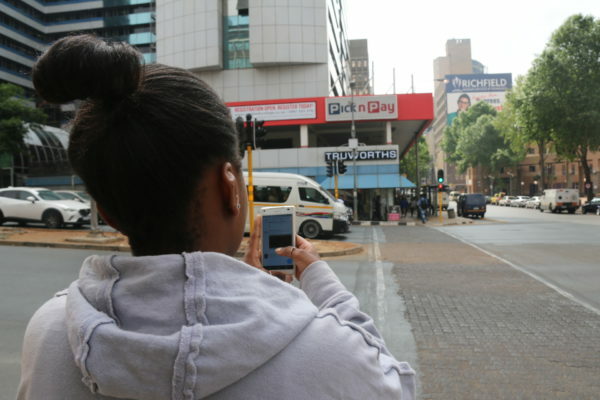 Matlhoko said the app will come into effect by the end of this year starting with Bree Street Taxi Rank and Noordt Taxi Rank in Johannesburg. One of the students who attended the event said that she was for the idea of smart cities, however believed there is still room for improvement. “I think in terms of using information systems, we can change the way we live in cities especially by improving it,” said Noreen Wahome, Masters in migration and displacement student. “But having said that “I think there are issues around it [smart cities] because we live in Africa. I think the government uses technology but they don’t know what they are using it for,” she added. Wahome believes that security and health technologies should be improved particularly in Braamfontein especially “since it is considered as a smart city”.